Richard was delighted to be commissioned by Toshiba to design a visual identity for a sub brand to be launched in 2010. The product itself is confidential at this stage but is an exciting development in television technology. The project has been completed and Rupert Standley, the Toshiba Marketing & PR Manager, was delighted with the logo. 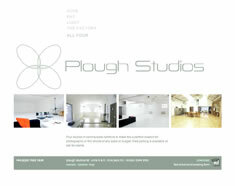 Richard is pleased to announce the launch of the Plough Studios website. Plough Studios is a complex of four photographic studios in Clapham and the website project was completed alongside a review of their visual identity. This successful partnership asked Richard to design a micro site to promote their investment activities. The website was completed on budget and ahead of schedule and can be viewed here. Richard is pleased to have been commissioned by Plough Studios, a photographic studio complex in Clapham to develop a website for them. The project will include adapting their current logos for use on the web and to incorporate a new fourth studio to their identity. The website is due for launch in July.